Well, Thursday morning started with a bash for Bollywood lovers. The first and the unseen posters of the much-awaited movie ‘Padmavati,’ directed by Sanjay Leela Bhansali, have been released. Within few minutes, the news started trending on the social media. And, to be honest, all the posters of the movie are simply awesome, and we just can’t wait to see the movie in theaters. Well, till then, have a look at the posters. Is Padmavati’s look better than the ‘Mastani’ and ‘Leela?’ Do let us know your views! Amir Khan’s Leaked Pics From The Sets Of ‘Thugs Of Hindostan’ Will Leave You In Shock! 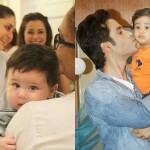 Cuteness Alert: Baby Taimur Is Having Fun Time With Tushar Kapoor’s Son And The Pictures Are Equally Cute! ← We Bet That You Have No Clue How These B-Town Celebrities Are Related To Each Other!